If there's one message I want to send via this blog and my book, it's this: Get outside. The more time we spend in the outdoors reconnecting with the natural world, the healthier our minds and bodies will be and the more likely we'll become good stewards of the environment. That's my opinion, at least. Last week I had a chance to put this simple idea to work with a dozen high school students. We spent the week mostly outside in a variety of landscapes, studying our local plants, animals, and fungi—and nourishing ourselves with the natural foods found all around us. On Day 1 we went to the beach. 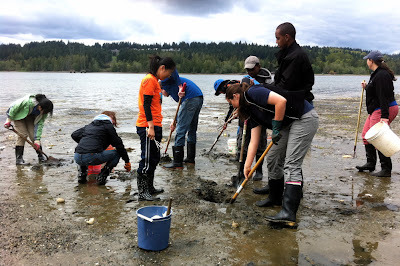 Most of the kids had never dug clams before. They found sand dollars and learned about invasive critters like the oyster drill. A few of them even sampled a raw oyster for the first time. Time passed quickly as they explored Puget Sound's nearshore habitat, watching fly fishermen cast for searun cutthroat, munching on a sea bean or two, and noting a patch of Japanese knotweed that had gotten a foothold above the tideline. After digging limits of Manila clams we steamed our catch on camp stoves, to unanimous approval. There was a palpable sense of achievement: we're eating food we had gathered just moments earlier. It tasted fresh and satisfying. Day 2 was spent in the Cascade foothills outside Seattle, where we hiked a few miles and identified dozens of edible plants along the way. We nibbled some and picked quantities of others for a Friday feast, including stinging nettles, fiddleheads, and miner's lettuce. The urban foraging component on Day 3 was perhaps the most surprising part of the week, as we found all kinds of delicacies in a public park just a few blocks away from school. 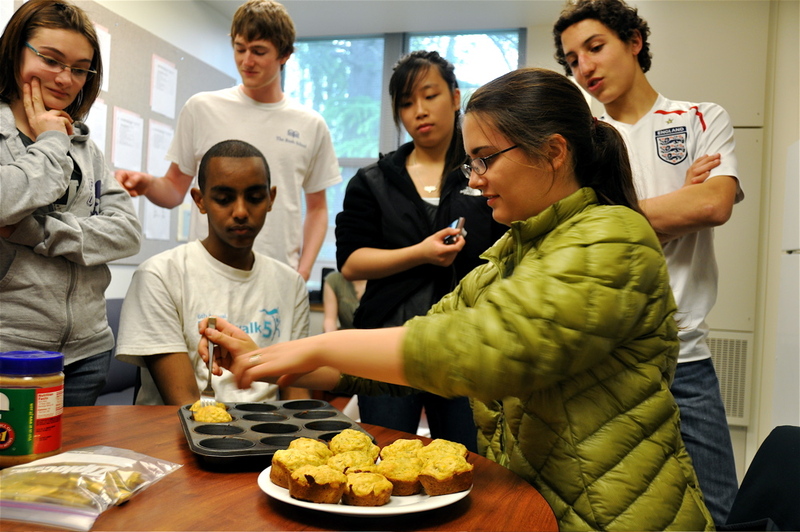 The students picked enough dandelions to make several loaves of bread and a platterful of Dandy Burgers. But that was merely the beginning. 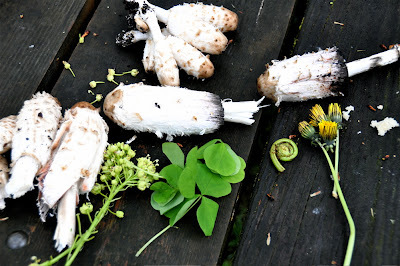 Right in the city we found fiddleheads, wild wood sorrel, maple blossoms, and even a patch of shaggy mane mushrooms in prime condition, inspiring two of the students to compose "Ode to a Shaggy Mane," the tragic tale of the mushroom's biological imperative to deliquesce. 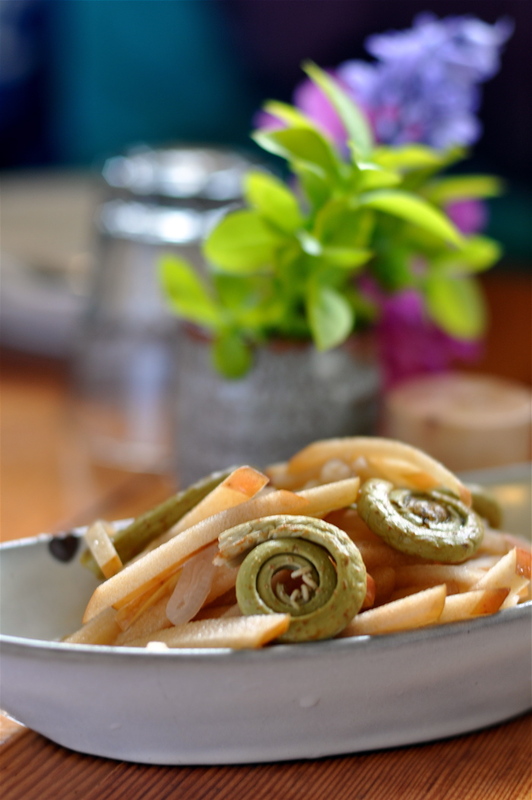 Also on Day 3 we had lunch at Nettletown to see how a local restaurant incorporates wild foods into its menu (verdict: delicious) and then broke into smaller groups back in the school kitchen to make Dandy Bread and Muffins at the end of the day. Day 4 was a jaunt to the sunny side of the mountains to look for morel mushrooms. Who doesn't love a treasure hunt? After I confirmed that a few of the cryptic caps were indeed poking out of the leaf litter, the students slowed down and started scanning the ground with intensity. Occasional hoots and hollers punctuated their discoveries. The excitement of the mushroom hunt was in the air. Our morel season has only just begun in the snowbound North Cascades but we found enough to saute up a panful with garlic and shallots and enjoy the distinctive earthy spring flavor of morels over sliced baguette. For Day 5 the students gathered one last time to spend the day writing about their experiences before cooking a celebratory meal. I couldn't be there for the final feast, but no matter; at that point they had confidence in their abilities to plan and execute a wild food menu of their own devising. Susanne, their teacher, told me later that "the kids really impressed themselves and the people around campus. It was a gorgeous sunny day so we set up a table out on the grass and had a picnic." What a perfect way to conclude a week in nature's class room. Wow, what a great opportunity for those kids! That's the kind of school I would have shown a little more I retest in! WOW! 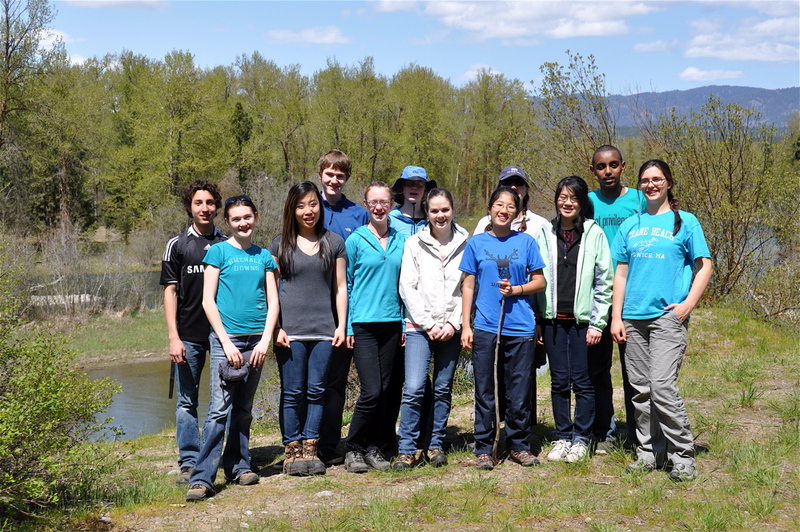 Such a great opportunity for these students and for the planet to gain a few more stewards. What an inspiration. What a cool school! What a wonderful experience that these kids will probably carry with them for the rest of their lives. I'm glad they had better luck with the morels than I did this week. I thought perhaps Umtanum Canyon would be a good place to hunt, given the many cottonwood trees growing there but was disappointed. Perhaps next time! I agree 100% This looks like the kids had great fun and learned a lot from this experience. Thanks for the comments everyone. I have to say, it was great to look at the world through the eyes of a teenager again. They were a fun, imaginative bunch. Although I've been disappointed in the lack of substantive foraging-related posts here over the last several months, I have to give you major props for this. For kids who don't come from outdoors-oriented families this is a rare opportunity - very glad to see you making a direct contribution to young peoples' lives in a way the formal education system simply can not. I completely agree with you that getting outside will help people become more aware of their environment. I taught a summer school class that was centered around water. Everything from the biochemistry of water to aquatic ecosystems. We had lots of field trips. When we first started, most of the kids didn't even know where their drinking water came from but by the end they were doing water quality testing at different sites in Portland. 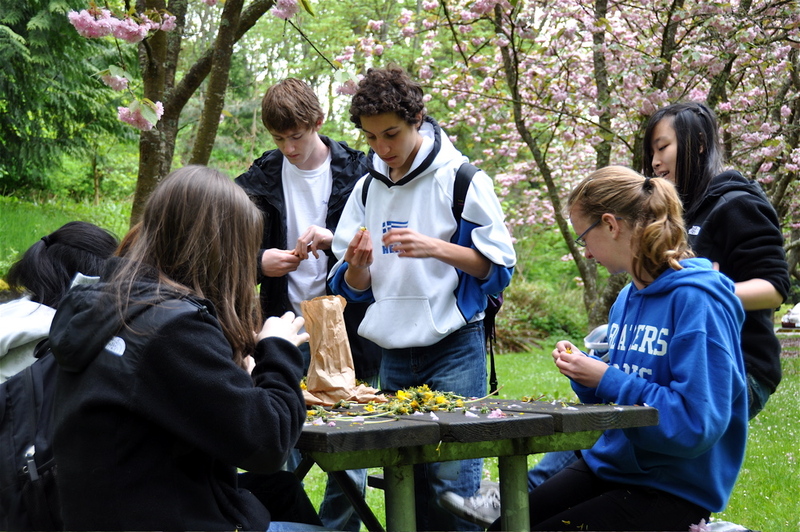 Anyhow, I think it's awesome you got these kids out and about interacting with the natural world. We need more of these kinds of programs! What an excellent week spent with young people... gives one hope for the future. Excellent! I don't believe there is anything more valuable to the planet's well-being than shedding some light on the wonder of our environment for a group of kids who may not otherwise have experienced it...big props on your involvement!